Build and play experiences don’t come any bigger than our LEGO Technic 42082 Rough Terrain Crane. This 2-in-1 Technic set is our largest and tallest so far – and you get to decide whether it’s a mobile crane toy or a mobile pile driver – just build it the way you want it. The LEGO motor power makes it a breeze to operate this advanced building set with its upper and lower crane functions. Before you do any heavy lifting, though, make sure you lower the stabilizer legs. Then you’re good to go…rotating through 360 degrees, using the lifting winch or raising the boom arm a meter into the air. There are lots of other moving parts that make this mobile crane toy so much fun to explore and use, like the 4-wheel steering, 4-wheel drive, detailed V8 engine with moving pistons and fan, and adjustable wing mirrors. The driver’s cab door also opens and there are 2 opening compartments where you can keep your tools, chains and fire extinguisher. There are also 4 outrigger landing plates plus 4EGO Technic building sections that you crane into place as you get busy building. 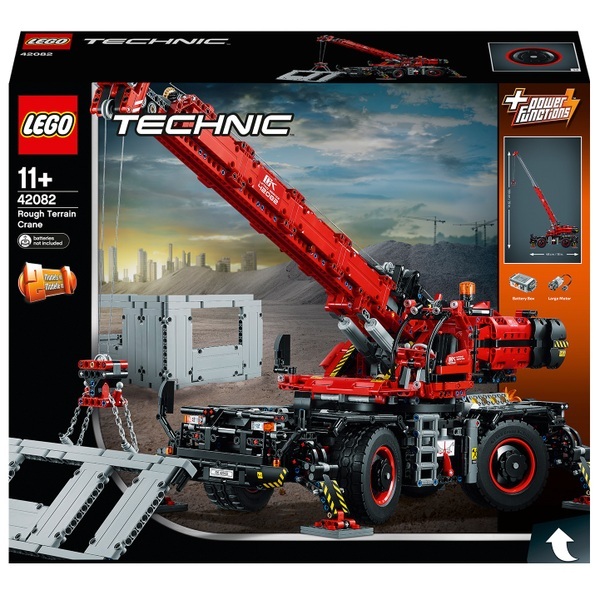 This distinctive red and black 2‑in‑1 LEGO Technic set is loads of fun – you just have to decide whether it’s going to stay a crane or if you’re going to rebuild it as a Mobile Pile Driver. Rough Terrain Crane measures over 39" (100cm) high, 25" (66cm) long and 10" (26cm) wide in working position, and over 10" (27cm) high, 29" (76cm) long and 7" (20cm) wide in driving position. Mobile Pile Driver measures over 9" (24cm) high, 19" (50cm) long and 7" (20cm) wide in driving position.